Should Anyone Be Able To Take A Job Anywhere? Some argue that workers should be able to move more freely in a global economy. But others push back, saying an influx of labor into the richest countries would devalue workers' worth and actually hurt more in the long run. 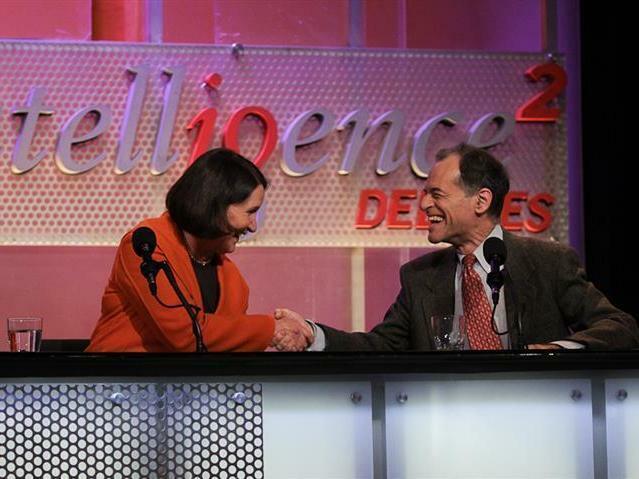 A group of experts debates for Intelligence Squared U.S.
Kathleen Newland and Ron Unz argued against the motion "Let Anyone Take A Job Anywhere" in an Intelligence Squared U.S. debate on Oct. 30. In a global economy, does it make sense to allow workers to move freely? Letting people go where the jobs are would improve the lives of millions around the world, some argue. But others say an influx of labor into the richest countries would devalue workers' worth and actually hurt more in the long run. A group of experts recently took on this question in an Oxford-style debate for Intelligence Squared U.S. They faced off two against two on the motion "Let Anyone Take A Job Anywhere." Before the debate, the audience at New York City's Kaufman Center voted 46 percent in favor of the motion and 21 percent against, with 33 percent undecided. After the two sides faced off, 42 percent voted in support of the motion while 49 percent voted against — making the side arguing against the motion the winners. Bryan Caplan is professor of economics at George Mason University and senior scholar at the Mercatus Center. He is the author of The Myth of the Rational Voter: Why Democracies Choose Bad Policies (2008) and Selfish Reasons to Have More Kids: Why Being a Great Parent Is Less Work and More Fun Than You Think (2012). He has published in The New York Times, The Washington Post and The Wall Street Journal and appeared on 20/20, Fox News and C-SPAN. He blogs at EconLog, named a top economics blog by The Wall Street Journal. Caplan is currently writing a new book, The Case Against Education. 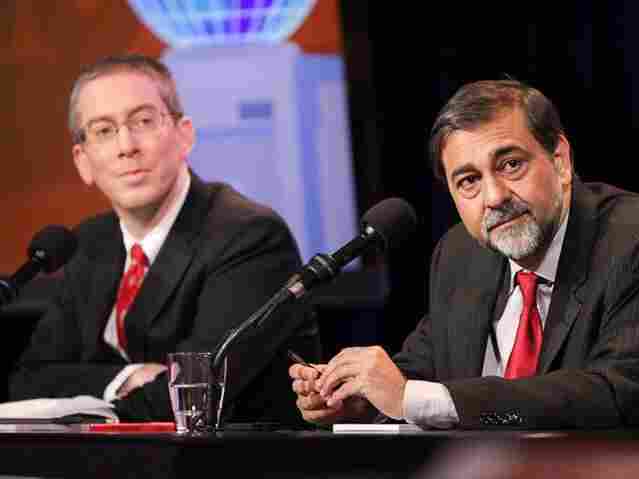 Bryan Caplan (left) and Vivek Wadhwa argue in favor of the motion "Let Anyone Take A Job Anywhere." Vivek Wadhwa is vice president of innovations and research at Singularity University and a fellow at the Arthur and Toni Rembe Rock Center for Corporate Governance at Stanford University. He is also director of research at the Center for Entrepreneurship and Research Commercialization at Duke University's Pratt School of Engineering and distinguished visiting scholar at the Halle Institute for Global Learning at Emory University. He is author of The Immigrant Exodus: Why America Is Losing the Global Race to Capture Entrepreneurial Talent (2012), which was named by The Economist as a book of the year. He was named by Foreign Policy magazine as a Top 100 Global Thinker in 2012. In 2013, Time magazine listed him as one of the 40 most influential minds in tech. Kathleen Newland is the co-founder and a trustee of the Migration Policy Institute, where she directs policy programs on migrants, migration and development and refugee protection. She has worked as a consultant to the United Nations High Commissioner for Refugees, the International Labor Organization, the Office of the Secretary-General of the U.N., and the World Bank. Prior to MPI, she co-directed the International Migration Policy Program at the Carnegie Endowment, lectured in international political economy at the London School of Economics, and was the special assistant to the rector of the United Nations University. Currently, she is an overseer, as well as chairwoman, of the Advocacy Committee of the International Rescue Committee and a board member of Kids in Need of Defense, the Stimson Center, and USA for UNHCR. She is chairwoman emerita of the Women's Refugee Commission. Newland is the author or editor of eight books, in addition to many shorter monographs, book chapters, policy papers and articles. Ron Unz, the publisher of The Unz Review, is the former publisher of The American Conservative, a small opinion magazine, and is the founder and chairman of UNZ.org, a content-archiving website providing free access to many hundreds of thousands of articles. He previously served as the chairman of Wall Street Analytics Inc., a financial services software company that he founded in 1987. His writings on issues of immigration, race, ethnicity and social policy have appeared in The New York Times, The Wall Street Journal, Commentary and numerous other publications. In 1994, he launched a Republican primary challenge to incumbent Gov. Pete Wilson of California, running on a conservative, pro-immigrant platform, and received 34 percent of the vote. Later that year, he campaigned against Proposition 187, a ballot measure aimed at denying public services to immigrants who entered the U.S. illegally.